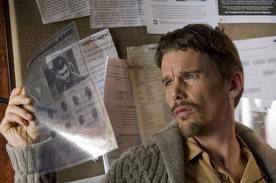 Plot: Ellison (Ethan Hawke) is a has-been writer who moves his family into the house of a crime scene, which will be the subject for his new book. A family had been slaughtered, but the daughter mysteriously vanished and the perpetrator was never found. Ellison intends to cast light on the mystery, but finds some old Super 8 footage, which contains murders of other families. When strange occurrences begin to happen, he begins to suspect that his family is the next target. Even worse, the killer might be of the paranormal kind. While I am thrilled that the horror genre has been financially successful in the wake of “Paranormal Activity“, I wish it was another trend that took off. There was a time when I would watch any horror film released on the big screen, regardless of its quality. Yet in the past month or so, I’ve been actively skipping all of the new releases. Why? I can no longer tell the difference between any of them. I didn’t bother watching “The Possession“, “The Apparition” and “The House at the…something” because they all look the same. Even the ones I did like, such as “The Woman in Black“, “Insidious” and “Don’t Be Afraid of the Dark” have the same basic premise. All of these films are about parents trying to protect their children from a supernatural entity. Sure, sometimes they are dressed differently with the location or visual style, but they are all telling the same story. I’ve just gotten tired of seeing the same set of cliches over and over again. Even “Paranormal Activity 3” had its franchise jump on that bandwagon too. 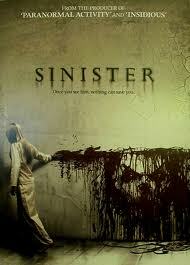 “Sinister” doesn’t break the cycle of redundancy, but it offers a hefty amount of thrills and chills anyway. When I reviewed “New Daughter” (another movie about a parent struggling to protect his children), I pointed out that the favored occupation for protagonists is ‘writer’. If it’s not a writer, then it’s an artist of some sort. Guess what Ellison is? If you thought anything but ‘writer’, then you haven’t seen too many of these movies. He’s also trying to follow up on his past success., but it’s not working out very well. So from the beginning of the movie, you will know that it’s time to bring out the convention check list. The Angry Sheriff who wants Ellison out of ‘his’ town? Check! The clumsy deputy who wishes to help? Check! The couple has two kids, one sweet and one sour? Check! They whine about the new move? I think you get the point, but we must not forget that Vincent D’Onofrio plays the expert who’s around to deliver exposition. Every ghost thriller needs one of those! Once again, why is there no attempt at changing the set-up? Luckily, C. Robert Cargill (the writer; Carlyle from “The Spill Crew“) managed to blunt this flaw by adding a touch of humanity to all of these cliches. The Angry Sheriff has reasonable reasons for wanting Ellison to leave, the clumsy Deputy is actually competent and the kids aren’t THAT bratty. They aren’t just one-dimensional stock characters, if anything. Ellison is an interesting hero because he’s intelligent and decent, but is trying to justify his selfish ambitions as heroic. He’s not perfect, but he knows it and there is a moving pay-off to his faults.. The scenes where he’s watching old interviews made me feel sad for him. I cared for these people and that is more important than ‘originality’. Scott Derrickson is primarily known for directing “The Exorcism of Emily Rose” (above average) and “The Day the Earth Stood Still” remake (average), but my favorite film of his is the highly underrated “Hellraiser V: Inferno“. While “Sinister” isn’t restricted to any specific brand of horror, both movies were effective for the same reason. They relied on a paranoid atmosphere. They had strong protagonists who become increasingly unhinged as the story progresses, which is reflected in the (rather subtle) visual style. This is a risky way of developing suspense because if the actors aren’t up to the task, it will backfire and “The Devil Inside” is born. Thankfully, Ethan Hawke nailed the role and watching his panic grow is infectious. This meant that even when things weren’t making me jump, I was always in a state of nervousness. His terror became my terror. Once again, I find myself lamenting how important actors are in horror films. If they seem afraid, that can rub off on us and make the movie scarier. But my poor genre has become too cheap to hire ‘real’ actors, so it’s saddled with the worst reputation when it comes to acting. At least the filmmakers of “Sinister” seem to agree with me. It snagged a respectable cast who deliver stellar performances. Derrickson uses other ways to instill fear in the viewers too. Possibly drawing inspiration from “Lake Mungo“, there is a lot of spooky imagery that’s easy to overlook at first glance. This is especially apparent when Ellison is analyzing the mysterious found footage. I was always peering intently at the screen, wondering if I’ll spot a ghastly figure that blends seamlessly in the background. That kind of stuff always gives me chills. There are plenty of golden “jump” scares and the villain is certainly menacing. Some of the more twisted kills almost have a surreal edge to them. The opening shot of the family hanging is just as weird as it is unnerving. They might’ve done nothing new with the story, but at least the creativity ran high when it came to dreaming up ideas that would crawl under the audience’s skin. Unfortunately, “Sinister” starts to run out of steam during its third block. Once those ghostly children show up and play hide-and-seek with Ellison, I started to lose interest. Corspy looking children don’t scare me and it betrays the tone, which the rest of the movie had worked so hard to maintain. I’m more afraid of the stuff we either don’t see or barely see, like the main antagonist. It just seemed like it was showing too much. After this, it just never completely recovers. There are some disturbing moments, but the scares become too desperate (the final shot) and I wasn’t quite as invested. Still, when the horror worked, it worked wonders. I disagree with any reviewer who claims that “Sinister” is the next big thing. Usually, the big horror films were either original or packaged themselves in a way that seemed original. 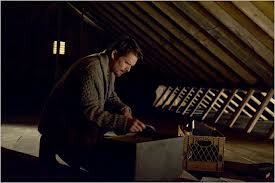 “Sinister” doesn’t try to hide or even satirize (probably for the better) its cliches. On paper, it’s a very conventional movie. But at least it executes those conventions better than most of its contemporaries. It has better characters, dialogue and never has any baffling plot holes or stupid character decisions. Furthermore, the filmmakers continuously found ways to creep me out. In the end, isn’t that what the horror genre is all about? “Sinister” doesn’t push any boundaries, nor will it rejuvenate horror movies. But it is one of the better examples of its kind and if every ghost-thriller was this good, I wouldn’t be complaining about how similar they are. Violence: Rated R, but it’s mostly left to the imagination. That doesn’t make it any less brutal. Overall: If you like these kinds of “haunting” movies, give “Sinister” a look, because it’s a cut above the majority of them. “The Conjuring 2 (2016)” review. “Crimson Peak (2015)” movie review.